What I love doing around this time of year is dedicating a couple of evenings in December (once the chaos has simmered) to bake up batches of delicious Christmas cookies or quick & cute DIY treats (Check out this awesome one) to gift to family, friends and neighbors. I love being creative with how they are packaged to make for an added special touch. 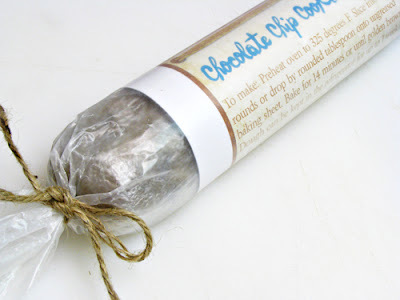 One year instead of sending off baked cookies because of my time crunch, I instead wrapped up a Cookie Dough Log complete with baking instructions. What completes a nice package of goodies is an adorable gift tag. Here is a round-up of some free printable Christmas gift tags for you to use on your Christmas packages! Enjoy! Check out this cute free printable gift tags over on Sass & Peril! I especially love the red + aqua! Miss Pickles Press has always been one of my *favorite* designers so naturally I’m in love with her free printable Christmas gift tags! Domestifluff has these graphic gift tags available for free too! Love the stripes + all the patterns! Click here! I love how Lovely Design shows you how to use her stylish printable gift tags! They’re free too, so hop on over! These gift tags are just GORGEOUS and would be perfect on a fancy dessert or even a bottle of wine! Click here to head over to design, wash, rinse, repeat! Mailing your sweet goodies? These cutie red + aqua striped mailer labels are PERFECT!Thanks Eat Drink Chic! Monogramming will never go out of style. This cute gift tag from Martha Stewart is perfect or all sorts of gifts! This chic ornament gift tag is so darling! One of my favorites – from Martha Stewart! These are my absolute, hands down, FAVORITE free printable gift tags! Exudes modern elegance and they also have them in a red/aqua so hop on over to Jones Design to see! The holidays are all about packaging! Great round-up! I see a few that I really like and will probably be using! Thanks!!! Great ideas…these look really cool!!! wow … i love these!!! Give me some ideas in time for the Holiday Season! I saw this post back in December and gave out a bunch of homemade Christmas cookie dough to friends and family. They loved the packaging! Ever since the feedback I got back from the Christmas dough, I’ve been using the decorative packing idea to package all sorts of gifts from baby shower favours to teacher gifts. Thanks for the idea!